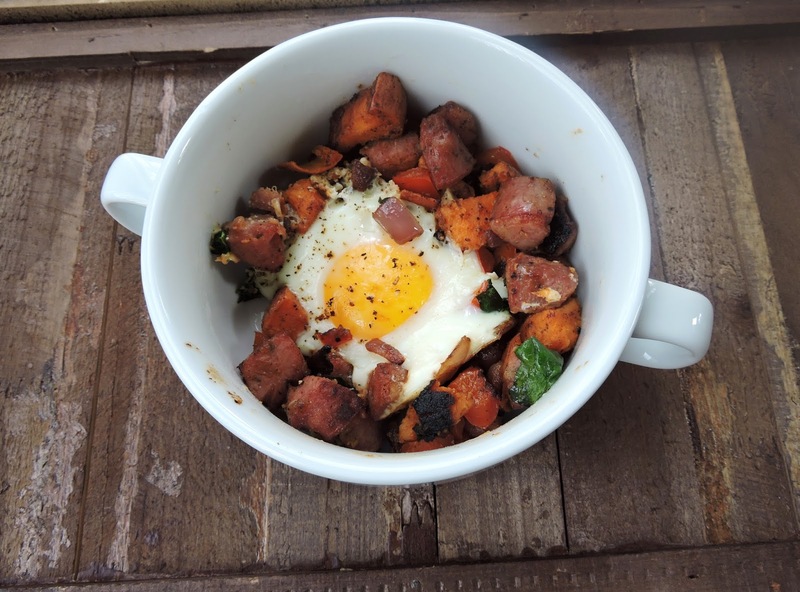 I love breakfast dishes that can make a beautiful Sunday brunch, but also store & reheat easily so that they can be portioned into leftovers for the week. This dish was created with that meal prep scenario in mind, but was also inspired by my non-egg-loving friends. Some of you (including my little brother) have asked for egg-less dishes that still make a healthy, hearty breakfast. Whether you're allergic, sensitive, or just don't like eggs~ this would be a great one for you. Just call it done before the eggs are added in. I hope you enjoy the smokey-sweet flavors of this dish. 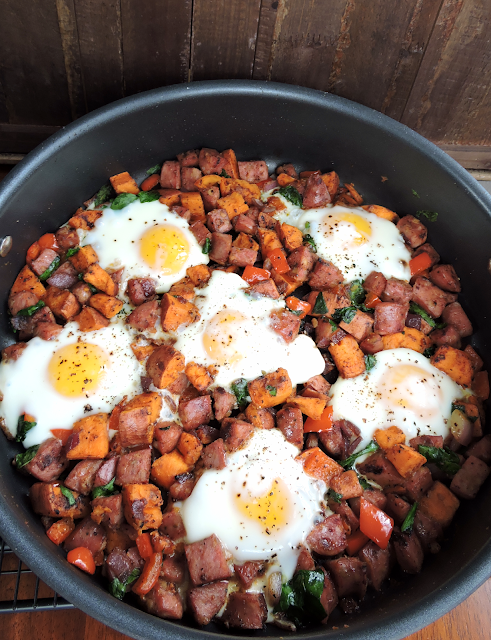 The ingredients are simple, but this breakfast becomes something special with a little spice! Scrub the sweet potato & use a knife to poke a few small holes in it. Wrap the sweet potato in a damp paper towel, and microwave for 4 minutes to soften it and start the cooking process. Cut the sausage into pieces. I quartered mine lengthwise then sliced into small bite-sized chunks. Cut the sweet potato into similarly-sized cubes. Chop the onion, bell pepper, and spinach. Heat the avocado oil or ghee in a large skillet. Add the sausage, sweet potato, onion, and bell pepper (saving the spinach off to the side), and sauté over medium high (stirring often) for 3 minutes or until the potatoes are light brown & softened. Add the chili powder, and stir until the spice is fragrant (about 1-2 minutes). Stir in the chopped spinach, and reduce the heat to medium. Dig six "holes" in the hash mixture, and crack an egg into each one. * Sprinkle the entire dish with salt and pepper. Cover the dish with a lid, and cook until the whites are opaque (8-10 minutes or so). Scoop out & serve hot. It tasted great served with hot sauce & avocado! I use Aidells Chicken Apple Sausage links that are fully cooked. If you are using uncooked sausage, brown that first before sautéing the remaining ingredients. 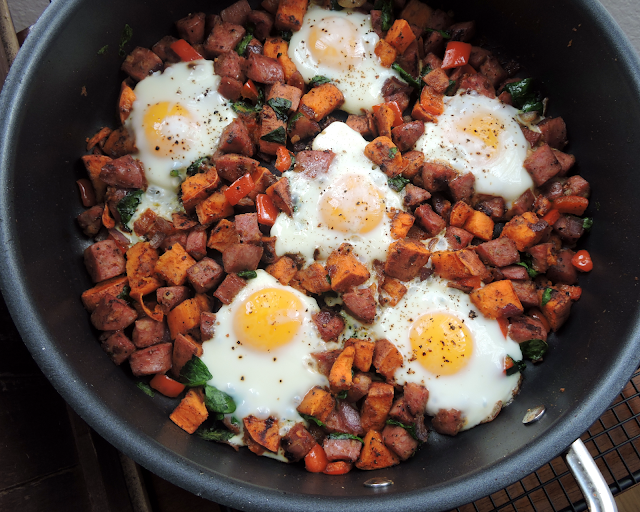 Leave out the eggs for an egg-less "hash" or use whatever amount you like. If you're nervous about getting eggshells in your dish, crack the eggs into a small bowl one at a time~ then pour them into the skillet one by one. This will give you the chance to pick out any shells. If you have sticking anxiety like I do, drizzle a little extra avocado oil in each "hole" before dropping in your egg. If you don't have a lidded skillet, you can also finish this dish off in the oven. Preheat the oven to 400ºF, then bake the dish after step 5~ for about 10 minutes or until the eggs are cooked. Nice hearty dish for any time of the day.